Although our movements and collective struggles lack sufficient resources to explore the current state of our operating environment, extensive research points to a gruesome fact: democratic spaces are experiencing a severe global backlash from governments and violent non-state actors. And the worst part is that there is very little accountability for the risks, threats and violence being experienced by inspiring and committed individuals all around the world who are striving for one collective aim: living in free, equal and just societies and communities where all of our identities are not only accepted unconditionally, but also celebrated. Threats and restrictions targeting civic freedoms came under the spotlight when the UN Human Rights Council appointed a Special Rapporteur on the Freedom of Assembly and Association in 2010 and 2013, making it clear that internationally acknowledged and guaranteed freedoms that enable all of us to participate in democratic processes, were experiencing a backlash. Additionally, last year, Freedom House declared 2015 to be the tenth consecutive year of the decline of global freedom in terms of curbs on civil liberties. Alarmingly, CIVICUS further backed this claim by identifying a growing list of 96 countries in which there are “serious threats” to civil society operations. 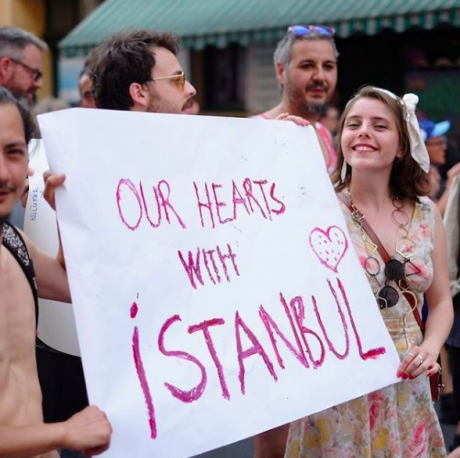 A sign in solidarity with Istanbul Pride, banned by the Turkish government in June 2016, at an LGBTQ march in Berlin. We are both activists and come from Turkey and Brazil respectively. Both our countries have launched full-on attacks on those who hold their governments accountable for human rights violations, as well as those who actively work together with movements to live in a world free from violence and discrimination. However, the resilience of movements in both our countries prevent us from being overly pessimistic about our collective ability to prompt meaningful change. Realizing how movements across the world are re-imagining their strategies and connecting with struggles from diverse regions and issues, we are slightly revising our framing of the crackdown that various forms of activism across the world are experiencing. Movements all across the world are reclaiming democratic spaces and are pushing back the backlash. Unfortunately, the most powerful states all across the world from the US to China, to Russia and South Africa - with immense economic resources, sophisticated state apparatus’ and the most powerful militaries at their disposal - are terrified of one thing above all else: individuals, organizations and movements who document human rights abuses, and expose their governments’ shortcomings with respect to justice and equality. In a very shortsighted attempt to ramp up illegitimate governments or leaders, activism has increasingly become a national security issue. In the eyes of governments, we are the threat, we are the vandals, and we bring the kind of undesirable dissent that questions their legitimacy and accountability. In the US, the #Blacklivesmatter movement challenges structuralized racism, while holding the security forces accountable for the systematic targeting of Black lives. In Russia, the clampdown on LGBTQ activism is a pathetic attempt to maintain the hetero-normative and patriarchal optics required to sustain Putin’s ruthless and highly macho rule. The thriving queer activism is perceived as an imminent threat that disrupts the hetero-normative status quo. In China, despite immense surveillance and intimidation, women’s rights organizations are challenging gender-based discrimination and violence, and collectively advocating for a public space free from sexual harassment. In South Africa, strong indigenous activism in defense of land, territory and life is resisting the colluded public-private partnerships of extractive industries. Despite the rise of new forces of oppression, there are growing cracks in old systems of power thanks to the committed efforts of all that operate to reclaim democratic spaces. While doing so, cross-movement efforts to rethink strategies and learn from each other’s experiences are used as a deliberate tactic to strengthen responses to threats, risks and violations. A recent example is the establishment in March 2015 of the WHRD MENA Coalition (Women Human Rights Defenders Middle East and North Africa) to collectively respond to restrictions and violence. Although MENA women have a long history of regional collaboration, this formal effort to bring together WHRDs (women human rights defenders) from different movements to collectively strategize, brainstorm and learn from one another is consistent, structured and has the ability to strengthen regional responses. One must note that the Coalition has come into existence at a time when the region is shaken to its core by wars, sectarian violence and highly polarized competing interests. The value of cross-movement collaboration is immeasurable in a world where states routinely invoke strategies that deliberately attempt to isolate and demoralize activists. 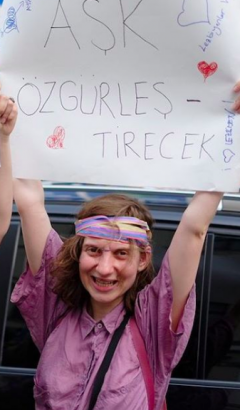 In 2012 Turkey, a broad alliance between the women’s rights, LGBTQ and minority rights movements pressured the government and provided direct input into one of the most progressive pieces of anti-violence legislation in the region, and definitely in the world, although problems with the implementation of the law do exist. No one can argue that Turkey is a country free from gender-based violence and discrimination. However one must also acknowledge the significant contributions of cross-movement alliances in pushing back the backlash on identities and struggles. Similarly in Brazil, cross-movement collaboration was crucial to reduce the harm brought about by draconian anti-terrorism legislation. The intricate alliance of social movements and organizations of all sizes and sectors pressured the government and several arbitrary and disproportionate restrictions, which would criminalize activism, were removed. In November 2015, during a global civil society roundtable, Maina Kiai, the Special Rapporteur on freedom of peaceful assembly and of association, said: “The old methods aren’t working. Maybe it’s time for us to think of new ways to push this agenda. We need to think outside the box.” And we are. For this very particular reason, the AWID Forum in Bahia, Brazil from 8-11 September is bringing together diverse components of democratic spaces to collectively reassess our current methods and explore innovative responses and strategies to reclaim it. In order to push back the backlash and enlarge our spaces for action, we should internalize a culture of democracy within our movements. There must be absolutely no room for any obstacles that prevent the absolute acceptance and celebration of our diverse identities and struggles. Movements from different regions and demands complement each other due to the wealth of distinct experiences and strategies. It is only through providing the space and resources for movements to meet, collaborate and learn from each that we will be able to build responses in a creative and innovative manner. In our path to building new and effective strategies, we should all build on the experiences of activists and movements who preceded us and who resisted backlashes similar to the ones we are experiencing currently. 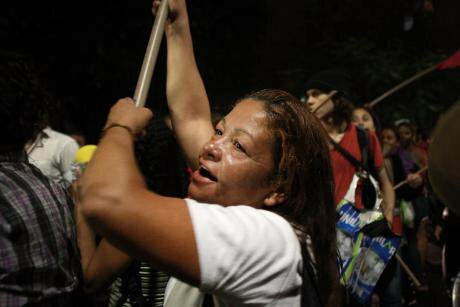 Ana Cernov will be a facilitator in one of the umbrella sessions - Reclaiming Democratic Spaces - at the forthcoming AWID Forum Feminist Futures: Building Collective Power for Rights and Justice, 8-11 September, Bahia, Brazil.